Emily Kennerk is awarded $5,000 and an installation spot at 250 Monroe for "Whisper", presented at Pitch Night Indianapolis. GRAND RAPIDS, Mich. June 10, 2015 – ArtPrize, the radically open international art competition decided by public vote and expert jury, today announced the winner of Pitch Night Indianapolis, presented by Delta Air Lines. "Whisper" by Emily Kennerk impressed the jury at this evening’s event, held in the Toby Theatre at the Indianapolis Museum of Art. Kennerk is the recipient of the third and final $5,000 Pitch Night award of 2015, also securing an installation spot on the second floor of 250 Monroe, a brand new City Center venue for ArtPrize Seven. Five artists were invited to present at tonight’s Pitch Night event, each were given five minutes and five slides to pitch their installation concept for the vacant space located along one of downtown Grand Rapid’s busiest streets. The large venue will be split in half and shared by the winners of Pitch Night Minneapolis and Pitch Night Indianapolis. Emily Kennerk impressed a panel of local arts professionals including Anila Quayyum Agha, 2014 ArtPrize Public Vote and Juried Grand Prize winner; Mindy Taylor Ross, Owner of Art Strategies; Sarah Urist Green, creator, curator, and host of PBS web series The Art Assignment; Scott Stulen, Curator of Audience Experiences and Performance at the Indianapolis Museum of Art and Rosanne Winings, Assistant Curator of Audience Experience and Performance at the Indianapolis Museum of Art. “We talked about content but also about how, visually, it would be stimulating, how it would integrate the audience—there were multiple things we discussed to come to the final selection,” explained Agha. “Not to say the other artists who participated weren't good. All of them had thought really deeply about the space. It's sometimes hard during the jury process to find the one person or one project that is going to really work. I hope these people will apply next year again; I would like this project to continue in Indianapolis." Indianapolis based sculptor and installation artist Emily Kennerk’s previous work is visually and conceptually diverse, often highlighting the more melancholic aspects of American suburban life. Kennerk’s proposal for 250 Monroe invites audience participation. 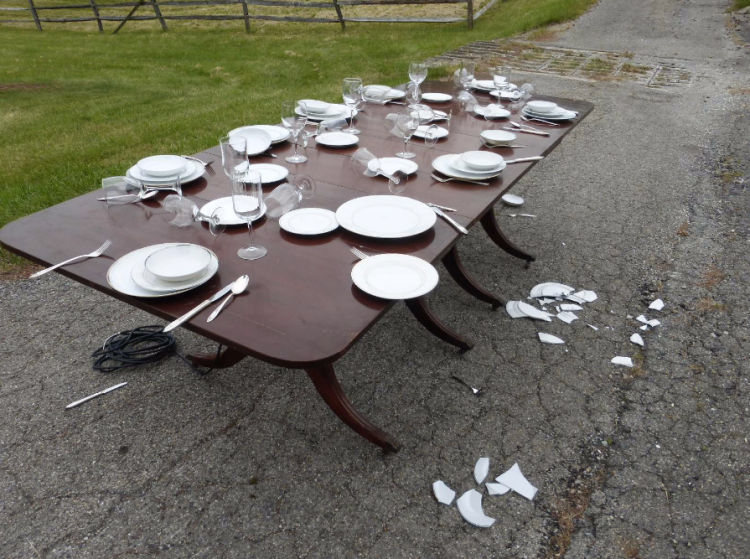 The installation of a 70-foot-long table complete with traditional western table settings, including ceramic plates, bowls, and glasses, will be at the mercy of audience member voices: two microphones attached to the work will respond to whispers, setting off a vibration reaction within the oversized table and disrupting the integrity of the crockery. The work will continue throughout the event with table settings being replenished. “Even though this piece is in a high rise and it's removed from the outdoor public, it sounds like it's in the thick of things—I definitely wanted to respond to that," explained Kennerk. “I’m excited because I've never done a participatory piece, and it's kind of countered to the way I usually work. Initially when I made the prototypes I was wondering 'where am I going to put a 70 foot long table?' but ArtPrize is the perfect place." In 2013, ArtPrize launched Pitch Night at the Walker Arts Center to discover exciting, ambitious projects and to reduce the barriers that out-of-state artists face in bringing them to the annual competition. Pitch Night expanded to Cincinnati in 2014 in partnership with 21c Museum Hotels—a partnership which continued earlier this month with Pitch Night Durham, held at the 21c Museum Hotels’ North Carolina location. Additionally, Pitch Night has further expanded this year to include tonight’s event in Indianapolis, held at the Indianapolis Museum of Art. Each of these three events has culminated in the awarding of $5,000 and a spot in a prominent ArtPrize venue for the chosen artist during the seventh annual event. “ArtPrize Seven is honored to be hosting three enormously ambitious Pitch Night projects from winning artists across the United States,” said ArtPrize Exhibitions Director, Kevin Buist. “The inclusion of these diverse concepts provides ArtPrize with a greater creative breadth, making for an increasingly intriguing and exciting event." ArtPrize Seven will take place across downtown Grand Rapids, Michigan from September 23 to October 11, 2015. Artist registration for the seventh annual event closed June 4, artists and venue will continue to connect through June 18.